Federal prosecutors have charged a 28-year-old Afghan-American man with using a weapon of mass destruction and other charges in connection with last weekend’s bombing in Manhattan. Criminal complaints released September 20 in New York and New Jersey accused Ahmad Khan Rahami with planting a series of bombs in the two states. He was captured September 19 after being wounded in a gunfight with police in a New Jersey town. He remains hospitalized. He’s already facing state charges in connection with the shootout, which wounded two officers. Investigators say Rahami planted two bombs in the Chelsea neighborhood. One injured 31 people when it blew up. One didn’t go off. He’s also accused of leaving another set of explosives in a trash bin by a train station in another New Jersey town. Meanwhile, the FBI says it checked Rahami’s background two years ago after his father said he was concerned that his son might be a terrorist. Law-enforcement officials said on September 20 that Rahami’s father later told FBI agents that he actually only meant his son was spending time with bad people. But the officials said the FBI checked but found no connections between Rahami and international terror groups. Investigators said on September 20 that Rahami was captured with a notebook on him that contained extremist statements. “Death to your oppression,” the entry ended. The journal entries also included praise for Osama bin Laden and Anwar al-Awlaki, the American-born Muslim cleric who was killed in a 2011 drone strike and whose preaching has inspired other acts of violence. He also mentioned Nidal Hasan, the former U.S. Army officer who went on a deadly shooting rampage in 2009 at Fort Hood, Texas. 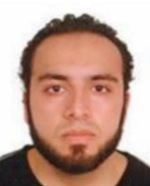 Investigators also said that Rahami had traveled extensively to Pakistan and Afghanistan in recent years.